Allegra Lilly was appointed Principal Harpist of the St. Louis Symphony in April 2013 and joined the orchestra at the start of the 2013-14 season. Since making her solo debut with the Detroit Symphony Orchestra in 1997, she has earned distinction as an award-winning and versatile performer of solo, chamber and orchestral repertoire. An experienced orchestral harpist, Ms. Lilly has appeared with the New York Philharmonic; the Boston, Chicago, Pittsburgh, Toronto, and Charlotte Symphonies; and the St. Paul Chamber Orchestra, under such celebrated conductors as Lorin Maazel, Christoph Eschenbach, Bernard Haitink, James Levine, Charles Dutoit, Esa-Pekka Salonen, Michael Tilson Thomas, and Rafael Frühbeck de Burgos. 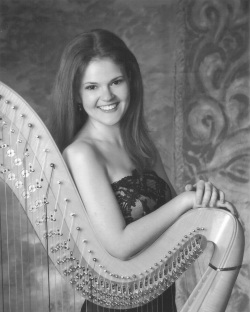 In 2011, she was the runner-up for the principal harp positions with both the Toronto and Charlotte Symphonies. Ms. Lilly has performed in several summer music festival orchestras, including Spoleto Festival USA, Festival dei Due Mundi in Spoleto, Italy, Artosphere Festival and National Repertory Orchestra. In 2005, she was selected as harpist for the inaugural performances at Lorin Maazel’s opera house in Virginia – an endeavor which ultimately led to the formation of the Castleton Festival, where she has since enjoyed four summers as principal harpist. As a chamber musician, Ms. Lilly has performed with the Argento Chamber Ensemble, AXIOM Ensemble and the Washington Square Ensemble, and is a frequent guest artist with Carnegie Hall’s Ensemble ACJW. An avid promoter of new music, she gave the New York premiere of Augusta Read Thomas’s Absolute Ocean for soprano, harp and chamber orchestra with soprano Amelia Watkins and Camerata Notturna. Other notable performances of recent compositions include American premieres of operas by Philip Glass, Guo Wenjing, and Toshio Hosokawa at Spoleto Festival USA, and the New York premiere of William Kraft's ​Encounters XII at the FOCUS! Festival with percussionist David Stevens. Ms. Lilly's appearances as soloist include concerto performances with the Juilliard Orchestra, National Repertory Orchestra, International Symphony, Metro Chamber Orchestra, and numerous orchestras throughout Southeast Michigan. As a solo competitor, Ms. Lilly has taken third place in the Concours International de Harp in Nice and second place in the American String Teachers Association National Solo Competition. Other awards include first place in the Juilliard Harp Concerto Competition, first place in the Detroit Symphony Civic Orchestra Concerto Competition, the James Tatum Foundation for the Arts Millennium Prodigy Scholarship, and the Robert and Elizabeth Traub Scholarship for music study in Europe. In 2008, she won the Anne Adams Award at the American Harp Society National Conference, where she was also a featured soloist. Born in Detroit, Michigan, Ms. Lilly began her study of the harp with Ruth Myers at age seven. She moved to New York at eighteen to join the studio of New York Philharmonic Principal Harpist Nancy Allen at The Juilliard School, where she earned both Bachelor’s and Master’s Degrees. Ms. Lilly performs primarily on a 2001 Lyon & Healy Salzedo.